A fun little strategy game with a zombie theme. Command fire teams in a desperate last stand against the walking dead. The blobs are in trouble again! This time their land is being attacked. Help them build a tower to keep off the bad guys. Try to survive as long as you can and reach the highscore list! In a world invaded by cars, your job is to ensure that they can't access your resources of gas. Use your heavy and powerful guns to destroy all the cars. Upgrade your guns as much as you can because is the only way you can survive. Try to last until the last car is destroyed. Are you ready for this ultimate battle: Cars vs Guns. You have to defend your base against powerful and fast cars who want to capture your reserve of oil. Build carefully your defense line, and try to keep it upgraded to be able to destroy all your enemies. Try to repel all the car waves and keep your base intact all the way. Let's win this Cars vs Guns battle. Papa Louie is branching out with a new taco restaurant, and he's putting you in charge! 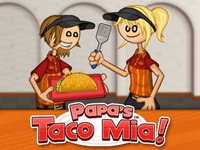 Help Mitch and Maggie take orders, cook meats, and build tacos in Papa's Taco Mia! Unlock over a dozen toppings and sauces as you work up the ranks, and craft the perfect taco for new customers and old favorites. Buy a variety of upgrades for your taco shop using your hard-earned tips and your weekly paycheck, and take on the extra challenge of serving the tough and picky "Closer" customers at the end of each day. Run the garage and serve all the customers with the best repairs and service. Make enough profit to reach the daily goals and buy fancy upgrades for your garage. Monster town is a resource management RTS game, where you build a town of monsters, developed technology through researches, build defenses equipment and monster troops to attack the opponent town to reclaim the glory of the monster. The Red Cross gives help to people in need all over the world regardless of skin color, nationality, beliefs or gender. Working for the Red Cross might be the toughest job on earth. Lives depend on your decisions, therefore you need to prioritize your tasks. When so many people are suffering who are you going to help first... Yes... it's a though call, but in the real world emergency situations are hard and sometimes breathtaking.